Multispectral imaging involves capturing images of an object illuminated in ultraviolet, visible and infrared light. Capturing images in different colours, including light that is invisible to the human eye, can reveal features on the books which cannot usually be seen. 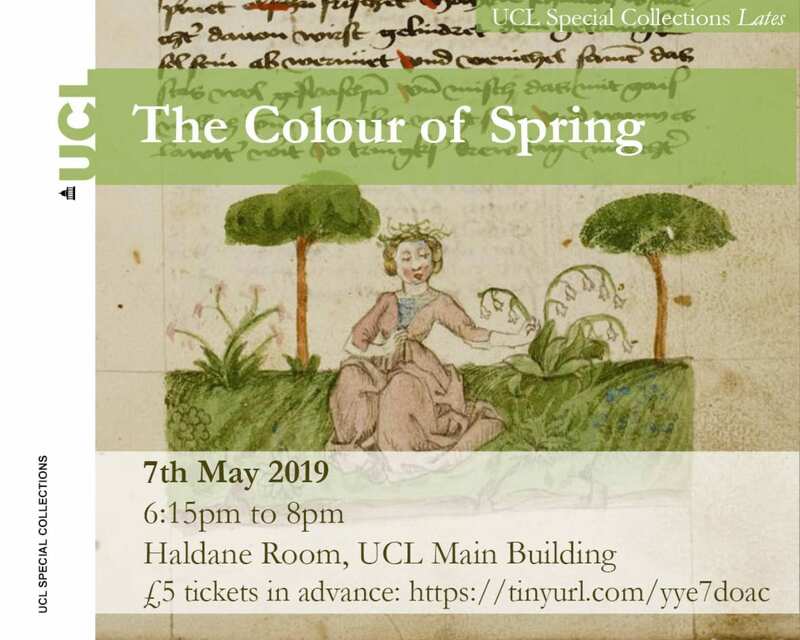 This talk by Cerys Jones, final-year PhD student in Medical Physics at UCL, will present a brief introduction to multispectral imaging in heritage and show several examples of recovering lost features on manuscripts and rare books in UCL Special Collections. 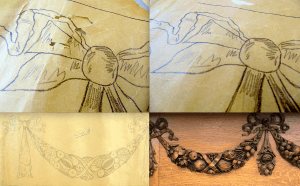 Politics and Pedagogy: How I made use of the Woodcraft Folk Archive. Rich Palser, a retired Further Education lecturer, is currently writing a book on the history of the Woodcraft Folk in the inter-war years which draws heavily on the organisation’s archives now held at UCL Institute Of Education. He will be talking about the archive’s relevance to his own interest in the relationship between politics and pedagogy, but also suggesting ways in which the archive may be relevant to the research of others. 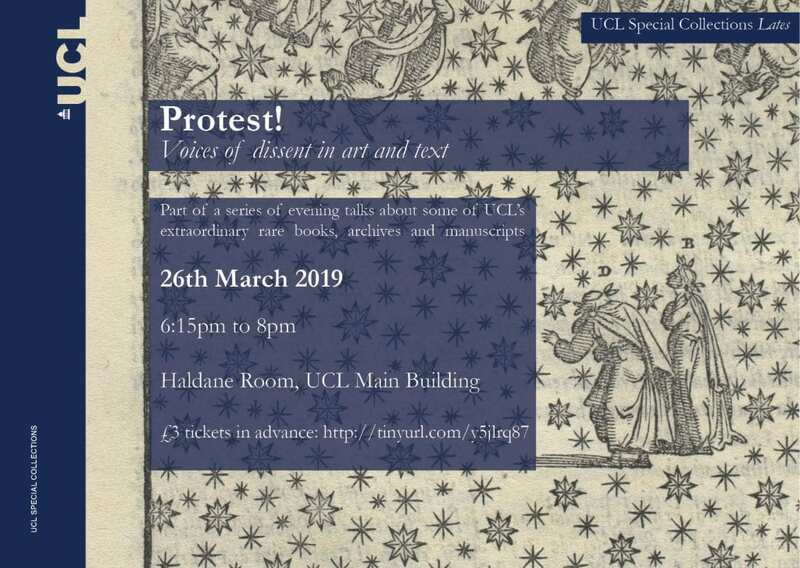 Guests will be able to view a number of items for UCL Special Collections, including medieval manuscript fragments, material from the newly acquired Woodcraft Folk Archive, and an emblem book once belonging to Ben Jonson. There will be a brief colourful interlude, courtesy of our conservation team, and there will be plenty of time to enjoy a glass of wine (or soft drink) and nibbles, included with your £5 ticket. Click here to book your place now! Our first Late will be ‘Protest! Voices of dissent in art and text’. Guest speakers Egidija Čiricaitė and Susannah Walker will join us to explore this theme through their fascinating research and corresponding collection items. Although all of our Lates events will have academic research at their core, they will be accessible and are open to all aged 16+. We hope you can join us for the first of what will be a regular series of talks and evening events to inspire, intrigue and amuse! The Small Press Project from Slade School of Fine Art takes inspiration from UCL Special Collections’ small press collection each year. This year’s project, Visions of Protest: BLAKE THE MARCH, has been used as a critical lens through which artists, academics and students can focus on what connections exist between the democracy of print, their aesthetics and the autonomy of artists’ books and publishing. The project is formed through a programme of workshops, performances, screenings, talks, collaborations and interdisciplinary practices involving non-academic institutions and the public. Egidija Čiricaitė will be in conversation with Liz Lawes, our very own small press collections expert (and UCL’s Subject Liaison Librarian: Fine Art, History of Art and Film Studies). Egidjia Čiricaitė publishes books, exhibitions, and book related projects. Although firmly based within contemporary artists’ books practice, her varied interests can be loosely divided between book history and contemporary metaphor theories (in linguistics). Egidija is co-curator of Prescriptions project of artists’ books and medical humanities (University of Kent). She is co-curating Artists’ Books Now events at the British Library and is currently studying for her PhD at the Slade School of Fine Art, UCL. On the 16th August 1819, a peaceful protest for electoral reform at St Peter’s Fields Manchester was suppressed. The large crowd, assembled to hear the orator Henry Hunt, were charged on by the local yeomanry cavalry resulting in casualties and injuries. The events became known as “Peterloo”, an ironic reference to the Battle of Waterloo of 1815. This was a pivotal moment in the histories of democracy, protest and “working class politics.” Peterloo inspired political pamphlets, poetry and caricature and most recently Mike Leigh’s film of 2018. This session will consider the memory of Peterloo in print using objects from UCL Special Collections and The British Museum. Susannah Walker was a Teaching Fellow in History of Art at UCL from 2014 to 2018 specialising in Print Culture and Romanticism, and is currently working as a curator in the British Museum’s Department of Prints and Drawings. Her recent work has involved cataloguing and researching a range of political pamphlets produced in the aftermath of the Napoleonic Wars. Wine (or a soft drink) and nibbles are included with your £3 ticket. Click here to book your place.